Roger’s behavior was not ideal this week. 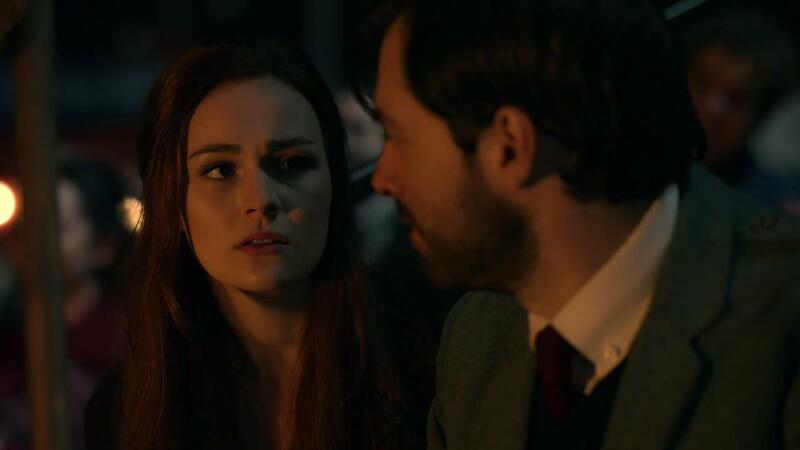 When you both read the script for episode 3, what did you think of how Roger completely mishandled everything with Bree? Rankin: [Laughs]I’ll let Sophie answer that one. Rankin: Trying to, yeah. Absolutely he’s coming from a loving place. Skelton: This is all coming right off the back of Brianna putting herself out there for Roger and him doing the same in terms of proposing. So they’re both feeling pretty bruised in that moment. That’s why that argument exacerbates and accelerates and escalates to the level that it does. Had they had this debate after dinner one night instead of out of the blue like this, it would have gone very differently. They’re both realizing something about the other one that they didn’t quite know. Richard, let’s hear from you. What did you think of how that argument turned out? Rankin: They’re both very valid in their opinions. They’re both justified in how they approach that moment. For Roger, it got quite heated at the end, but it’s coming from a place of vulnerability. After he proposed and it went so badly wrong, I think Roger lashed out from a place of being hurt. He was quite badly bruised by it. He was hurt because he put himself out there and bared his soul to Brianna. It’s not easy, what Bree did, either. She’s baring herself to Roger and put herself out there as well. She’s very vulnerable, she’s half-naked on the floor. Roger’s timing is not great, admittedly. It’s a bumpy road ahead of them in their relationship. Brianna is very young, trying to find her way in the world, and Roger wants a commitment without fully understanding her.